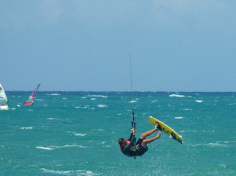 Cabarete is one of the 10 best spots to windsurf in the world and there are half a dozen world class windsurfing schools with rental equipment along Cabarete beach. The trade wind is strengthened by a thermal that makes the wind in Cabarete Bay stronger than in other spots of the Caribbean. 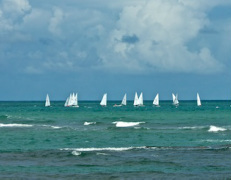 Cabarete Bay is ideal for both beginners and advanced windsurfers. The first 800 meters from shore is relatively flat water (ideal for free style and beginners) due to the protection from the reef. Further out, around the reef waves can get up to 5 meters. The biggest waves are in January. The closest windsurf center is about 300 meters down the beach from Hotel Alegria.